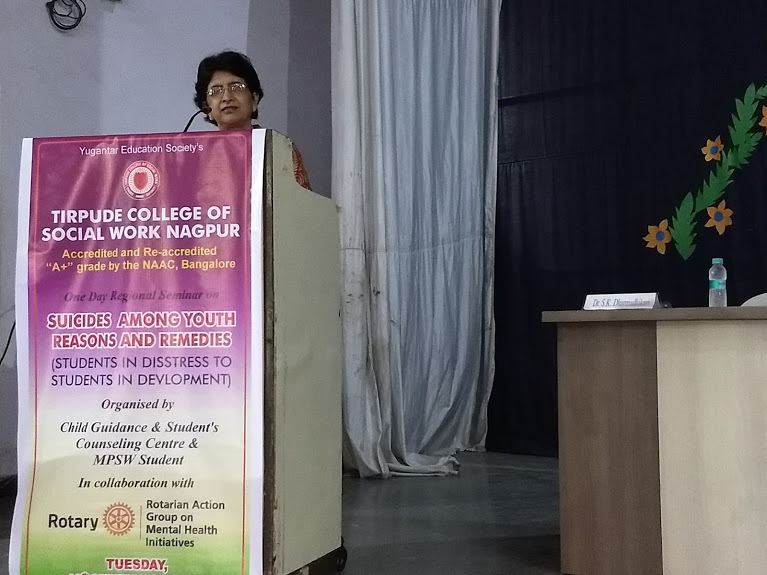 The theme of the workshop was, “Suicide among Youth: Reasons and Remedies.” The programme was inaugurated by the Assistant Commissioner of Social welfare, Government of Maharashtra and presided by the Principal TCSW, Dr. K.S.Patil. The speaker for the first technical session on the theme ‘Reasons of Suicide among the Youth,’ was Psychiatrist Dr. Sushil Gawande, followed by the second technical session by Psychologist & Board Member RAGMHI, Rita Aggarwal on ‘Empowering the Mind through Emotional Intelligence.’ The third technical session was on the theme of ‘Psycho-social correlates of suicide among youth,’ by social worker at the Regional Mental Institute Nagpur, Mrs. Sandhya Durge. This was followed by a role play on ineffective and effective methods of handling depression among the youth by the team of counsellors, Kunal Ashtikar, Rucha Vaidya and Shrishti Murarka. A panel discussion and open house for the students was conducted by Rita Aggarwal, Swati Dharmadhikari (Advisory Board member of Tirpude College) and Sandhya Durge where the doubts were clarified. 200 students from different colleges attended the workshops along-with teachers /lecturers from schools of social work from the city of Nagpur. The result of the workshop was that the Principal announced the importance of having a “help-line” for students in distress and promised a national seminar on mental health in this current year!